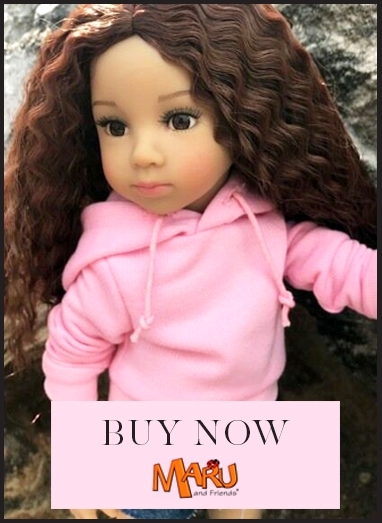 *This doll is due in stock in August. We recommend you place a separate and unique order for pre-orders so as not to delay the delivery of any other items attached to this order. Mary had a little lamb is your new Fairytale collectible doll from Maru & Friends, joining the Mini Pal series of 33cm dolls, sculpted by Dianna Effner. Limited to only 300 dolls worldwide. The story so far....Once upon a time, long, long, ago, there was a little girl named Mary, who loved her white sheep. The sheep, her pet, also loved Mary. This sweet and timeless story is the inspiration for Maru & Friends' second fairytale inspired collectible doll. Mary had a little Lamb doll has beautiful childlike facial features with rosy cheeks and lips. Her green glass eyes and long lush eyelashes accent her angelic delicate look. Her long curly wig is removable and made from the Maru & Friends' unique fabric. Her dress is made of white and blue jumbo gingham taffeta and has a peter pan collar. The cotton white ruffled apron features a small open pocket. Underneath she wears nursery rhyme pantaloons authentic to her character. Her outfit is finished with a Pamela hat with a blue ribbon. On her feet she wears beige lace up boots. Mary is made of hard vinyl, featuring a little darling style body that feels like porcelain but it’s all vinyl. This doll is a masterpiece and not to be missed!